Columbian College of Arts and Sciences Dean Ben Vinson will step down after serving five years in his role as dean in GW's largest school. Columbian College of Arts and Sciences Dean Ben Vinson has been named provost and executive vice president of Case Western Reserve University, according to a University release Monday. Vinson will step down after serving five years in his role as dean of GW’s largest school. He will assume his new position at Case Western Reserve July 2. Vinson came to GW in August 2013 to oversee the college’s three schools and more than 40 departments. During his tenure, Vinson worked to lift the University’s reputation in the arts by overseeing the merge of CCAS with the Corcoran School of the Arts and Design in 2016, but the school struggled to finish renovations on their flagship building because of funding. Vinson was also involved in working with the School of Engineering and Applied Science to open the $275 million Science and Engineering Hall in 2014. Several new programs and institutes launched in CCAS under Vinson, including an institute and scholarship for hispanic students, an institute for religion and peace studies and the Global Bachelor’s Program. Several new graduate programs were launched in his time, including master’s degrees in data science, leadership education and applied economics. Research was also a priority during Vinson’s time as dean. He worked with the research office to create new grant opportunities in the humanities and helped to start seminar-style courses with a research focus. After the provost office asked deans to create individual plans to increase diversity in each of the University’s 10 schools last year, CCAS started unconscious bias training for all new faculty hires. But throughout his tenure, the school cut a number of faculty searches across departments due to a budget crunch. After GW put a hold on hiring in 2014 and later announced another round of budget cuts in 2016, CCAS faced heavy criticism. 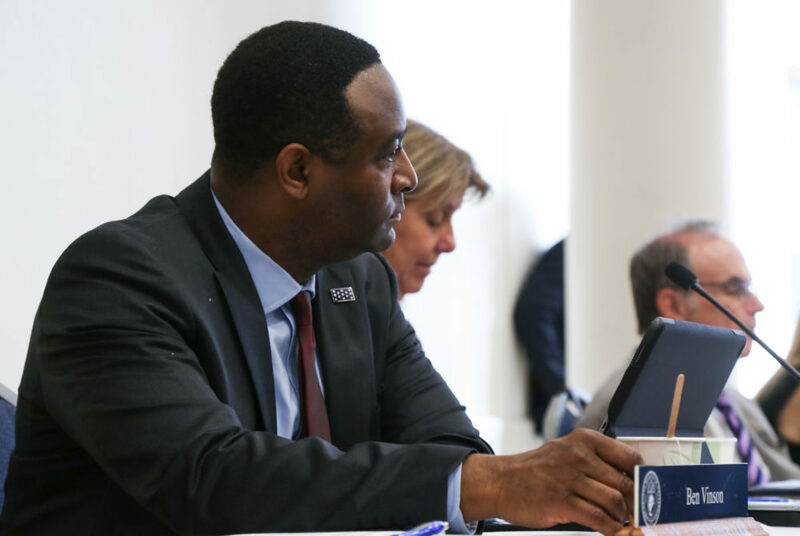 Vinson asked department chairs to find areas where the college could cut costs, and several looked to shrink financial aid packages for graduate students or reduce the number of course sections offered. Several departments lost faculty in the cuts, including the creative writing department and women’s studies program. Officials slashed the music department by 40 percent because of budget troubles in 2015 and this year, faculty in the religion department said the department’s budget was not enough to hire new faculty and launch projects. Before coming to GW, Vinson served as vice dean at Johns Hopkins University and a Latin American history scholar. Vinson was hired under former University President Steven Knapp in 2013, when he became the University’s youngest academic leader and only black dean at the time. Vinson’s replacement has not yet been announced. “Although I will miss working with Ben, it was inevitable that at some point he would take this step, and I wish him every success in his new role as provost,” Maltzman said.